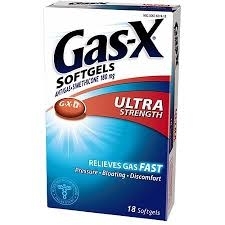 Ultra-Strength Gas-X Soft Gels: Tasteless soft gel is easy to swallow Ultra-strength gas pain relief to calm your upset stomach fast Simethicone soft gels help relieve stomach pressure, discomfort and bloating Made with simethicone, an effective gas-relieving ingredient. Swallow with water 1 or 2 softgels as needed after meals And at bedtime. Do not exceed 2 softgels in 24 hours except under the advice And supervision of a physician.